The reason I used to type a handwritten draft myself was not just because my handwriting is illegible; I preferred to do it this way as it allowed me to start the editing process while transferring the rough writing to a computer. So why not type directly into a PC first time round and save the time? Using a PC also means you have the edit facility, thesaurus, research button, spell check, grammar check at your fingertips, and they are all ready to interrupt your thinking - along with emails, Facebook and Messenger etc. I didn't want those interruptions happening while I was getting the story down, plenty of time for that stuff later. Well, that's what I used to think. On the left is a scribbled record of how much writing I achieved per day during my Montreal house-sitting stint between 15th July and 5th August a decade ago as I drafted Remorseless. My novels also take a great deal of research, and editing is very time consuming. With my recent novels, I have edited each around a dozen times, and read the entire draft aloud, at least three times, even before sending to beta readers. To make sure the dialogue is distinctive for each character, and the narrative runs smoothly. The difference is that I didn't go over any of my work during the manic ink-to-paper phase, so even with some days off, I had the basic novel in the bag at the end of three weeks. 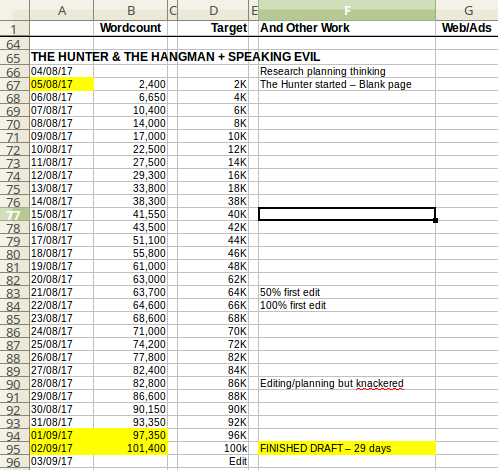 With The Hunter, there were more days of writing and no time off for good behaviour! And yes, I was exhausted at the end of each novel I've drafted as I find myself dreaming about the characters, waking up with them in my head, with ideas keeping me from sleeping until late and then driving me from my broken slumbers way too early. I admit, I am a bit obsessive (my ex says I have a 'mild' form of OCD) so during this three week period I lived 'Remorselessly'; I ate, drank, slept and dreamt of Doc and Leech. The same applies for each novel I have completed. With Remorseless, I recorded the hours I worked each day along with the number of words I had written (underestimated as mentioned above). Some sessions just whizzed by while others left me wondering where next, so I'd go for a run or have a few beers to loosen my brain cells and gain inspiration. This frantic flurry of writing works for me. At the end of the first draft, I have something to really work with, and the process never has a chance to feel stale or boring. The way all my novels have progressed surprised me at times and that makes writing them a better experience for me personally than reading the best tales written by other authors. And they all do look luvverly with the black covers, and I really adore that smoking gun and as my cover designer, Brian, says - "That noose looks badass!" The point is, to use a style and approach to writing that you enjoy and does not hinder your progress. Some authors like, or maybe need, a lot more structure than me - but it doesn't matter. it is best to just write in the way that's most comfortable and works for the individual.